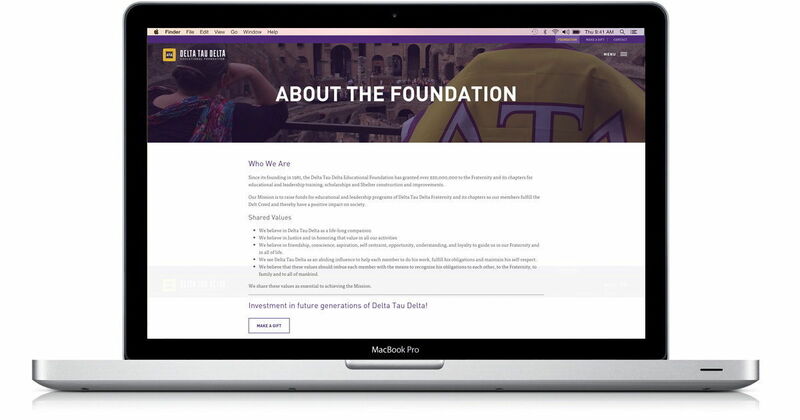 Delta Tau Delta was a returning client in need of a fresh website to take the place of their five year old website. In website years, that is ancient. As technology evolved at a rapid pace, their five year old website was considered ancient and did not truly reflect their brand. They needed a responsive site, with structural reorganization and more flexibility. Another challenge was incorporating their Foundation website into their main website. 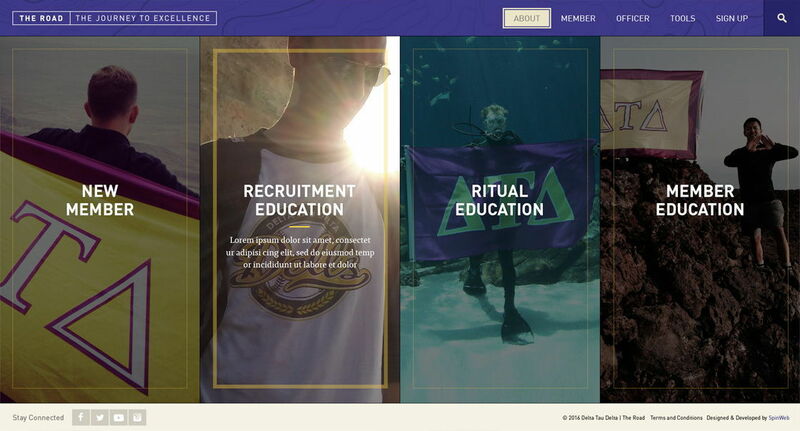 Many Greek organizations have two separate websites: a fraternity site, and a foundation site. We combined the fraternity and the foundation sites so that they operate under one website, a good move for branding, content organization and management. We took a complex, bulky navigational menu and created an off-canvas menu. The advantage of this design is that the org has more control and flexibility about how many items go into the navigation and subnavigation. It also gives the homepage a clean, uncluttered look. Off-canvas navigation gives website managers the ability to add as many navigation and subnav items to the menu, without cluttering up the homepage and interior pages. It’s simpler for users to navigate, as well. We’re familiar with the third-party systems that Greek organizations prefer. For this site, we styled their Blackbaud online giving page so that the click to “Make a Gift” is a seamless experience. Many Greek organizations have two separate websites: a fraternity site, and a foundation site. We combined the fraternity and the foundation sites so that they operate under one website, a good move for branding, content organization and management. The Road is a micro website for Delta Tau Delta that includes all educational programming under one umbrella. 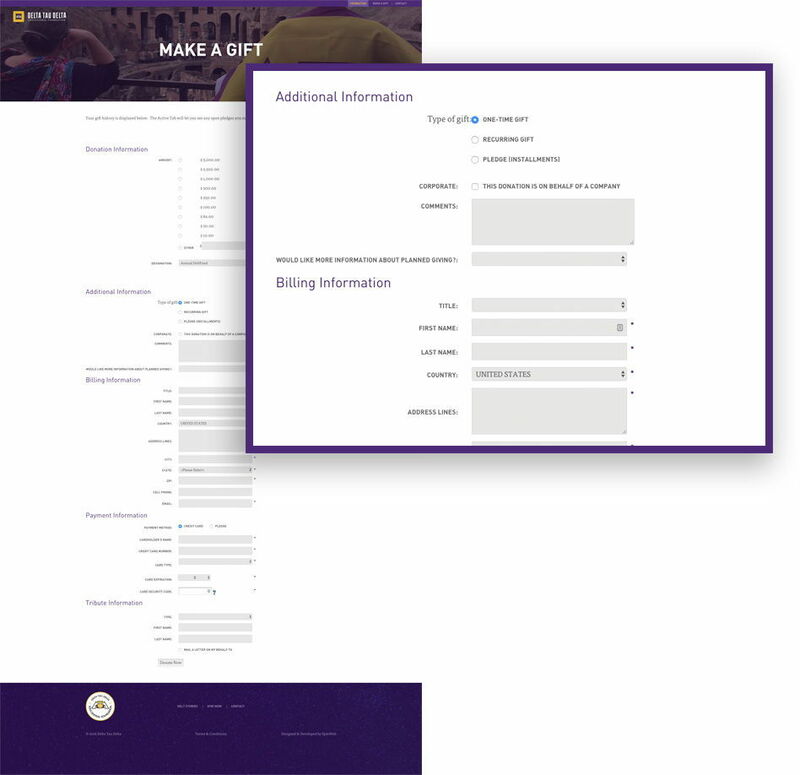 This microsite was previously part of the Delta Tau Delta full website, but now is a separate website tool for members. We built it with plans to expand functionality for member education in the future. The look and feel matches the main website for a smooth user experience. The visual layout of the website takes members on a journey through new member and recruitment, ritual education, and member education. This website is fully responsive and looks incredible on any device.